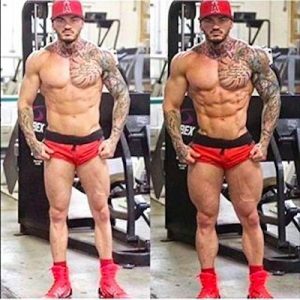 Lately we have seen a ridiculous amount of Photoshopped fitness photos showing the before and after results of various supplements and workout programs. We have been reaching messages through our Facebook Group asking us to expose the frauds and show our users how to touch up fitness photos for their clients. 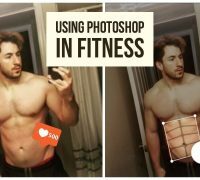 Many of our users are web designers and internet marketers that use imagery to sell products and services, this means that you better be up to speed on your photoshop skills if you’re gonna be pumping out Instagram content for your fitness clients. There was a local gym that had a personal trainer that was being followed by about 10k people. The guy was a legitimate personal trainer, but the before and after pictures showcasing the results were clearly photoshopped. To the untrained eye you may not notice the details we do when examining images. The supplement industry and the health and fitness industry is saturated with unrealistic claims of natural gains and growth. If you have been around either industry long enough you know what we are talking about. Photoshop has literally made people millions of dollars from the artificial enhancements users can generate with images. There is a ton of skill involved here, this aren’t overnight Photoshop editors, these people are legit. So how do you go about creating the perfect body in Photoshop? Here are a few video tutorials we found that you will find interesting. Take a look and try applying some of these techniques yourself. Here is a great example of a Photoshopped fitness picture. The problem we have with editors in this industry is that they are using Photoshop to create unrealistic expectations for young people. This causes people to create self-consumed complexes and can even cause depression among individuals trying to achieve the unachievable. If most people knew how heavily photoshopped the images on Instagram where they would never feel this way, but that is the world we are living in. People and brand use modified images to inflate value, inflate results and cause a sense of delusion among consumers. While we wanted to share some Photoshop videos that showcased the artistry behind the touch up of Health and Fitness models, we are against the machine that uses them to promote products and services that are not capable of providing the implied results these images represent. Photoshop is an amazing tool, using it to fool people into buying your products so that you can maximize profits is absurd. Next time your thumb scrubbing through your Facebook feed or Instagram account just think about these videos and the information shared here. Hopefully, it will allow you to take a deep breath and relax about your own body and circumstances. Just be healthy, exercise and diet properly! If you need help with your fitness goals you should contact a personal weight loss trainer.